In fact, if truth be known, there are few men who would not heed the call to battle if it meant saving someone’s life. He would run through fire, swim through ice, sling rocks at giants, wield a sword against the talons of a dragon or an M-16 against a terrorist. He would offer his final half-ounce of water in a burning desert, tie the last parachute on the back of anyone but himself while the plane spiraled toward the ground, or dangle by the strength of only his finger tips over a precipice of peril to reach a fallen and frightened stranger. You would do this. Wouldn’t you? Though the socially polite thing to say when asked this question is, “Well, I would like to think I would act heroic, but I guess you don’t really know until you’re faced with the situation for real.” However, deep inside, deep in your heart of hearts, you just know. You know you would take up the challenge. It would seem like instinct, but upon further reflection, as you looked back on your David against Goliath moment, you would know. You would know that you had been preparing for that moment your whole life. A thousand scenarios have played themselves out through your imagination. You’ve been preparing. You are prepared. In true moments of victory, your evaluation would not be pride. It would not be arrogance. No, it would be a simple evaluation of something you have always known. There would be no need to inform anyone else. It would be more than enough to have that certain knowledge now safely tucked away in your Man Portfolio. Stamp it bright red with “For Your Eyes Only” and then file it under H for Hero. Pull it out every now and then, not to gloat, but to prepare yourself even better for the next magical moment. You can relate to this, right? Then why is it that so many of us who know Jesus as our Savior, know his truth as our wisdom, walk with his Spirit as our scout, and acknowledge his Father King as our Liege Lord, fail to heed his call to arms? Why do we pass by as Satan’s victims languish in the bowels of his infernal kingdom of darkness? Why, especially since one of the most often used motifs in the Lord’s Great Commission strategy is the motif of rescue? Very truly I tell you, everyone who sins is a slave to sin. Now a slave has no permanent place in the family, but a son belongs to it forever. So if the Son sets you free, you will be free indeed. The Holy Spirit of God moved the Apostles of God to pick up this motif and record it in the word of God. And the things you have heard me say in the presence of many witnesses entrust to reliable people who will also be qualified to teach others. Join with me in suffering, like a good soldier of Christ Jesus. No one serving as a soldier gets entangled in civilian affairs, but rather tries to please his commanding officer. Let there be no doubt, there are damsels in distress. There are feeble men with neither the physical presence nor spiritual strength to engage the spiritual combat of our times. There are weak-willed women walking like zombies into the pit of despair. There are wonderful little children, confused and frightened, covering their eyes both at night and in the broad day light. There are teenagers acting brave on the outside, but running scared from what torments them on the inside. And there is a dragon on the loose (Revelation 12:1-17). He’s looking to scorch every man, woman, and child. And there is a roaring lion on the prowl (1 Peter 5:8). He is looking to devour the rich and the poor, the big and the small, the busy and the lazy. The dragon would torch his own mother if he had one. The lion would consume his own pride if he thought it would help his cause. The dragon is foul of breath and the lion is fierce of stench…for those with spiritual sense. For the blind, the lost, the unbelieving…the lion covers himself in light…a flimsy raiment of white silk…and the gullible fall for it until it is too late. They have but one hope: the Lord of Hosts and those of his who will rally to the sound of his voice…Go, therefore, into all the world. The enemy’s challenge is no different than a rude man talking offensively to your wife, mother, sister, or girl-friend. This is the same as a neighborhood bully slapping your precious ten year old daughter. This smacks of the same evil as the users and abusers who lead our boys and young men away. This is terror. This is abuse. This is crime. This is kidnapping. This is false accusation, slavery, discrimination, and torture. This is war! But you, dear friends, by building yourselves up in your most holy faith and praying in the Holy Spirit, keep yourselves in God’s love as you wait for the mercy of our Lord Jesus Christ to bring you to eternal life. Be merciful to those who doubt; save others by snatching them from the fire; to others show mercy, mixed with fear—hating even the clothing stained by corrupted flesh. When Jesus readied himself to return to his Father’s side he prepared his disciples for the departure. Central to his instructions is what we have come to call the Great Commission. It was not the Great Suggestion. It was not the Great Sound Bite. It was not the Great Encouragement. It was delivered as marching orders…it was the Great Commandment, the Great Objective, the Great Cause, the Great Commission. So, if like that first batch of disciples, we want to be ready in season and out we need to ask ourselves some questions. And just so it lands close to home, let’s be sure the questions are voiced in the first person singular. 1. What am I celebrating lately regarding my part in the Great Commission? 2. Do I really believe people need to be snatched from the fire? How is the prospect of a Christ-less eternity for the lost demonstrated in my worldview? 3. In Mark 2:40-45, I can read about Jesus touching a leper. The Bible said he (Jesus) was moved by compassion. Is this true of me? If I prepare like a ninja to protect my family or to rescue damsels in distress, what would preparing for this kind of compassion look like? ● How do I assess the needs of people I know who do not know the Savior? ● How do I assess the needs of people I meet occasionally? ● How do I assess the needs of those I may only meet once? ● In what ways do I have consistent contact with unchurched people? ● How do I identify and build relationships with the pre-Christians in my life? 4. When I look at the following chart of evangelism styles, where do I see myself? If I asked my closest loved ones, what might be their evaluation? 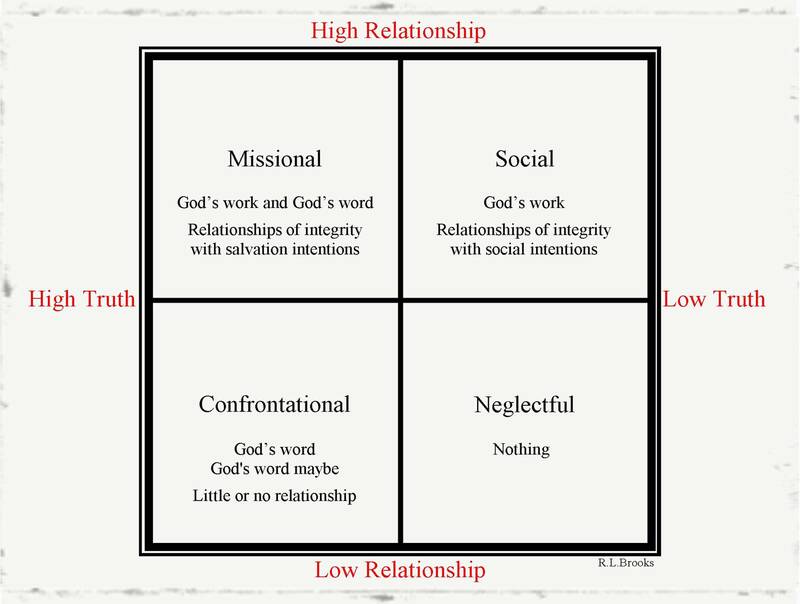 Let there be no doubt, only one of these quadrants is biblical: missional. Let there also be no doubt, I do not have today’s nuance in mind when I use the word “missional.” In stead, I mean it in its normal sense: the sense that points to every believer being on mission. With this in mind: the Church is a missionary force and every born-again believer is a missionary. 5. In what ways do I help my local church to corporately work at evangelism? ● If the following statement is true, “Some give so others can go,” what am I doing to facilitate its truth? ● What other resources do I have or can I acquire to facilitate the above statement? ● When was the last time I balanced my Great Life-style vs. my Great Commission ledger? Just thinking out loud. Peace.